Edible gold is a food trend that is still reserved for those with deep pockets. But it’s one trend that is getting quite popular around the world. There are gold-plated ice-cream, gold-plated donuts and even gold-plated pizzas! People are getting a taste of gold leaves on a number of food items. Last year, Bollywood celebrity Shilpa Shetty Kundra had made news for trying out a gold-plated soft serve in Hong Kong. The diva posted a video of herself trying out the luxury dessert on her Instagram page and it got thousands of views and comments, as well as generated a lot of interest around the dessert itself. For those who are looking forward to trying the dessert with edible gold in it, now you don’t have to travel all the way to Hong Kong to try it- you can get it right here in India! Huber and Holly is an ice-cream parlour that now has outlets in three cities of India- Hyderabad, Mumbai and Ahmedabad. 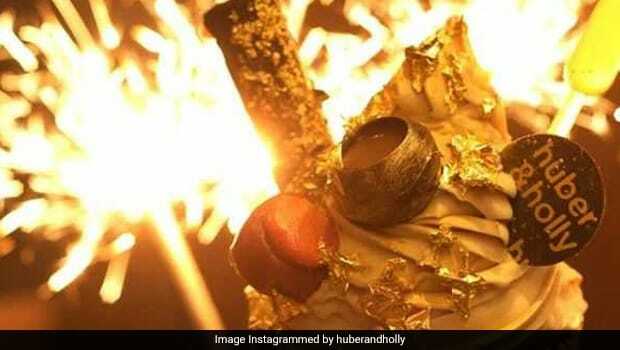 The ice-cream parlour is trending on Instagram for its most ‘Insta-worthy’ dessert- the Mighty Midas, which is made from numerous delicious ingredients and is topped with a 24K edible gold leaf. The ice-cream contains a waffle cone that is filled with brownie bits, caramelised almonds, nutty praline, crushed choco-hazelnut balls, a generous helping of hot fudge, three scoops of dark Belgian chocolate ice-cream, chocolate spheres filled with hot fudge, hazelnut chocolate spheres, a swirl of golden chocolate ice-cream, a caramel chocolate bar topped with gold flakes, pipette filled with passion fruit juice, a raspberry macaron and much more. Phew! The final touch is provided with the show-stopping ingredient- a fine 24K gold foil that the ice-cream swirl is decorated with. The final look of the gorgeous dessert can make the most staunchly sweet-hating people do a double take. The ice-cream is served with a sparkler- not that it needs any more bling- and can set you back by a whopping INR 1000! It will certainly take more than one person to demolish this dessert that is sure to give you a sugar rush that will last you for days. The ice-cream parlour has a range of delicious sweet treats, ice-cream cakes and pastries on offer, along with a delectable range of pastas and pizzas. They also have special footlong fries for the super fry lover in you. Would you try an ice-cream worth INR 1000? We’re certainly considering it. Let us know what you’re thinking, in the comments section below!